The Nebraska State Association of Secondary School Principals (NSASSP) recognizes the importance of extra-curricular activities in the total high school program. As principals, we are also well aware of the time commitment and dedication required on the part of students and directors alike to make extra-curricular activities meaningful and successful. Balancing these demands with the other multitude of demands placed on students and staff is no easy task. The brochure outlines in detail a number of substantive suggestions or guidelines that appear to be most applicable to bands and Instrumental groups that might perform at athletic contests. This document would be an excellent resource for new band directors just entering the profession. The NSASSP Executive Board Is of the opinion that the guidelines that you have developed are applicable and entail a number of conditions that should be reviewed by high school principals and discussed with high school band directors. We applaud your efforts to articulate a standard set of guidelines and expectations. We believe that this type of professional planning and foresight will most certainly yield positive results for the students in our schools. The Nebraska State Bandmasters Association offers the following guidelines to help focus the proper perspective of the pep band in the total band curriculum. Our guidelines were developed through a NSBA pep band committee, with input from several other states that have previously developed guidelines, and through the MUSIC EDUCATOR NATIONAL CONFERENCE, which has developed guidelines for performances of school music groups. 1. It is recommended that high school principals, athletic directors, and band directors select athletic contests at which they wish the band to perform during the year. The number of events should not exceed 16, excluding postseason games, with no performances during vacation periods. Rationale: This would establish a reasonable balance between pep band and the core of the band program. It would also lessen the possibility of exploitation of band students. 2. It is recommended that the decision for bands or pep bands to travel to preseason or postseason contests be determined in consultation between the principal and the band director. Rationale: There are a number of factors to consider, including weather, travel time. School time missed, parents' and students' wishes, expenses, the need for team support, and community pride. 3. It is recommended that pep bands perform at postseason football games, rather that the entire marching band. Rationale: Poor weather conditions, concern for uniform care, and excessive rehearsal time can diminish community pride in those bands that have limited marching band budgets and rehearsal time. 4 It is recommended that band students should not be expected to perform past halftime at home athletic events for which they perform. Rationale: Bands generally are able to do the bulk of their performing only before and at halftime of athletic events. Once the students in the band have completed their performing obligation, they should be free to choose whether or not to remain for the rest of the game and where to sit Although remaining for the rest of the game may give the appearance of team support, such a practice, when required, generally has a negative effect on the band students. 5. It is recommended that the band director should be consulted before any commitments are made on his or her behalf to perform for an athletic event. Rationale: Among school officials, only the band director has a true picture of the performance demands being placed on the band students at any given time. To commit the band students to a performance without consulting the director shows questionable judgment and a lack of understanding for both the students and their director. 6. It is recommended that bands should not be expected to perform at a pep band event if unforeseen and unavoidable conflicts with other school and community activities would not allow the remaining students to perform in a manner representative of that band program. Rationale: Athletic events offer an audience for band students. To expect them to perform ineffectively due to circumstances beyond their control has a negative effect on them, on their band, and on the school. 7. It is recommended that the school district or athletic department provide any performing band personnel admission fees to athletic events, including all tournaments and postseason play. It is also recommended that the school district or athletic department provide transportation to and from athletic events, including all tournaments and postseasons play, be provided by the school or athletic department. Rationale: They Nebraska State Bandmasters Association's perception is that it is unfair to require students to pay admission fees and/or transportation cost for any athletic event at which they are required to perform. Students and parents have already invested substantial amounts of money for instruments, instruction, music, uniform fees, accessories, etc. It is therefore, unreasonable to expect performing band students to incur additional costs when required to performers a supports group for athletic contests. 8. It is recommended that junior high and middle school bands not be held responsible for performing at pep assemblies and games. Rationale: In spite of pressures to have them imitate high school bands in these activities, at this level it requires a disproportionate amount of time, at the expenses of music learning to prepare and perform pep music on a frequent basis. 9. It is recommended that college athletic departments be required to provide transportation costs when inviting high school bands to perform at their athletic events, it is recommended that one per year be the limit. Rationale: It is felt that the taxpayers of each school dists4ict should not have to pay for entertaining at athletic functions other than the ones in the local district. The intent of the Nebraska State Bandmasters Association is composing guidelines for pep bands, is to insure that the primary goal of all band programs is to focus the teaching on long term values and not to let the adjunct organizations of the band program get out of balance in the total perspective of school band programs. It is important that the demands of public performances and competitive activities not be allowed to become dominant or excessive, and that public performances remain secondary to education in the curriculum. There should be no contradiction between the two because the former clearly supports the latter. This relationship, however, must be kept in perspective. By definition (see example below) the core of a band program is the concert band experience. The concert band group is the all-encompassing medium of exposure, which serves as the tool by which the student is introduced to the varied activities expected of any varied band program. An effort should be maintained to keep the total band education program in check with itself. Without controls (guidelines) music education begins to separate itself from the total band program pictures. 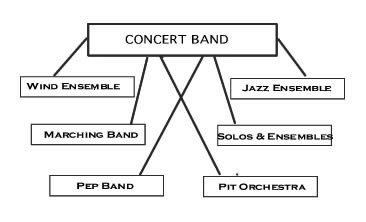 The diagram below illustrates and example of the structure that is often used in high school band programs. In the example, a student enrolled in the main concert band class may elect or be selected to participate in none, one, or several of the adjunct ensembles or activities. Each of the adjust ensembles or activities exists to further the students' skills in performing music, their knowledge of music, and their attitudes toward music. Although these groups may differ somewhat in the music they perform and the aspect of music emphasized, their main purpose of the education of the students. Adjunct groups or activities may rehearse during part of the regular band period or may have separately rehearsal times and function either as a regular class or an extracurricular activity. All adjunct ensembles or activities should require membership in the concert band. If there is a second or third concert band, the same pattern, with perhaps fewer adjuncts ensembles or activities may exist for the group.